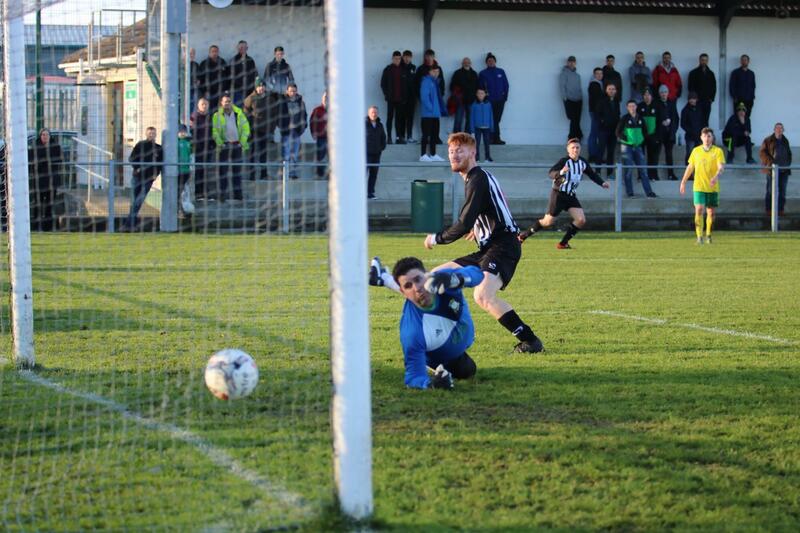 Munster Senior League champions Midleton FC showed all their class and quality when they eased to a comfortable FAI Intermediate Cup 3rd round win at Bonagee United on Sunday. The Cork side, who were clinical in front of goal, scored three times in the second half as they ended Bonagee’s cup hopes for another season. It was a difficult day for Jason Gibon’s Bonagee. They played well in patches and got themselves right back into the tie around the hour when substitute Mark McLaughlin’s goal made it 2-1. But within a minute, they conceded a third goal at the other end and there was to be no way back after that. For all their effort, Bonagee just couldn’t match a Midleton team who were making their third trip to Letterkenny in as many seasons. And after losing twice on the bounce at the same stage of this competition to Letterkenny Rovers, they finally made a winning visit third time around. They had to survive some early Bonagee pressure during which Michael Doherty had an excellent chance to put the home side in front but his shot was smothered by the outrushing keeper Andrew O’Donoghue. Then at the other end, there was another big moment when Bonagee defender Sean Hume was fortunate to be shown only a yellow card for a foul on Tijani Aibor. The Midleton striker was through on goal but referee Marty Quinn decided against brandishing a red card, much to the frustration of the visiting bench. Aibor was causing all sorts of trouble for the Bonagee backline and the home management decided to replace Hume with McLaughlin in attempt to quell the Midleton pressure. But the Cork side continued to carry a threat and they eventually made the breakthrough on 42 minutes when James Leahy turned home James McCarthy’s cross the right. Again, Bonagee started the new half well, but they conceded a poor second goal just before the hour. Adam Wilson raced from inside his own half after the visitors won possession following a Bonagee corner and Wilson’s swift counter-attack ended with him firing low past John Roulstone to make it 2-0. McLaughlin’s neat finish on 63 brought Bonagee back into the tie, but the tie was decided just a minute later when Ray Lally’s delicate volley beat Roulstone. Midleton substitute Conor Fitzgerald produced another classy finish on 94 minutes to cap a really impressive performance for the visitors. Jason Gibson will have few complaints about the result. His team has played better this season, but there were some good individual displays from Michael Funston in midfield, Gareth Breslin at the back and Darren McFadden up front. Bonagee United: John Roulstone, Mark Harkin, Tommy McMonagle, Gareth Breslin, Sean Hume (Mark McLaughlin 22), Ryan Rainey, Michael Funston, Dean Larkin, Garbhan Grant (Codey Brogan 75), Darren McFadden (Jordan Armstrong 64), Michael Doherty. Midleton FC: Andrew O’Donoghue, Alan Healy, John Keane, Kevin Murray, Gary Collins, James Leahy, Ray Lally (Seamus Farren 86), Kevin Tatton, Adam Wilson (ian Maher 78), Tijani Aibor (Conor Fitzgerald 90), James McCarthy (Cillian Hurley 83). Assistants: Vincent McLaughlin, Marty McGarrigle.